Here’s one of these concepts that’s focused less on high end specs and more on a special feature that sets it apart from the mass of products. 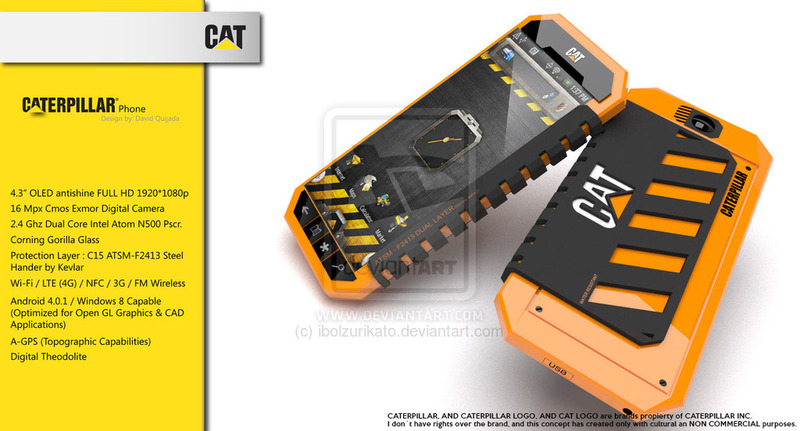 This one is the Caterpillar phone concept, created by David Quijada. I should probably mention that the Caterpillar brand is not officially associated with the product, to avoid any legal hassle. Since Caterpillar is all about constructions outdoors, I’m guessing this phone is resilient to all natural elements and more. The handset comes with a 4.3 inch OLED antishine Full HD display, a 16 megapixel CMOS Exmor Digital camera and a 2.4 GHz dual core Intel Atom N500 processor. It also has Gorilla Glass protection a steel hander by Kevlar protection layer. WiFi and LTE are here as well, plus NFC and FM radio.